The seventh annual RESPONSIBALL Ranking was published. 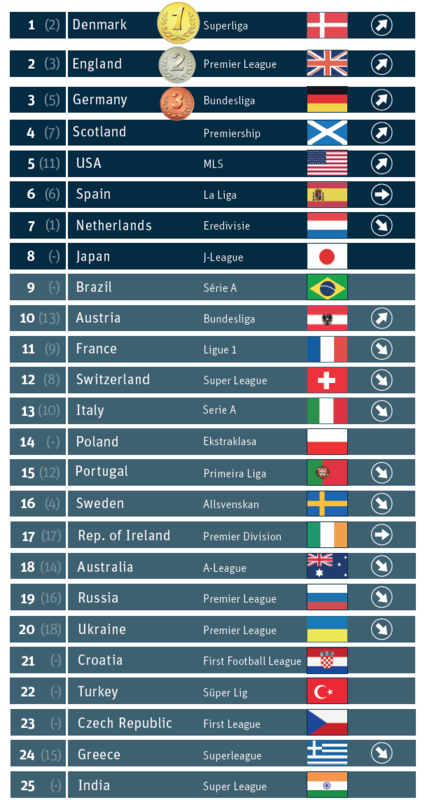 The Ranking presents the social responsibility scores of the first division clubs in top-level international football leagues. The 2017 Ranking saw a reshuffling of the RESPONSIBALL leaderboard. The Danish Superliga reclaimed their 2014 position at the top of the list as, once again, they drew upon a history of high adherence to governance standards, along with a strong commitment to community-based initiatives. The Netherlands, an overwhelming leader in 2015 and 2016, was surpassed this year by ever-rising league scores in England, Scotland, Germany, and the United States, whose Major League Soccer went up almost ten percentage points from last year (from 22% to 32%). Another notable decline from last year’s Ranking is Sweden. This year saw the addition of seven more leagues than last year’s Ranking, some having been in previous additions, others making their first appearance. Japan and Brazil started off their campaigns well, earning the respective eighth and ninth positions on the overall Ranking. The Japanese J-League proved especially strong in the Environmental category, coming in the third position (21%) behind Germany (28%) and the United States (22%). With new aggressive environmental policies and the upcoming Tokyo 2020 Olympic Games, the future of Japan’s football may very well be green. FC Thung (Swiss Super League) runs a program which promotes integration and inclusion within the community, working especially with refugee children and young people with mental disabilities.